MyHomeopathy is an application of kind dictionary allowing to reference a set of practical and public information relative to homeopathy. It does not aim to cure you or to supply you a prescription but to enlarge your basic knowledge on the homeopathic medicine for the common diseases. Homeopathy is more than a therapeutics but also a way of thinking that brings us closer to nature. This dictionary provides an initiation to homeopathic terms. 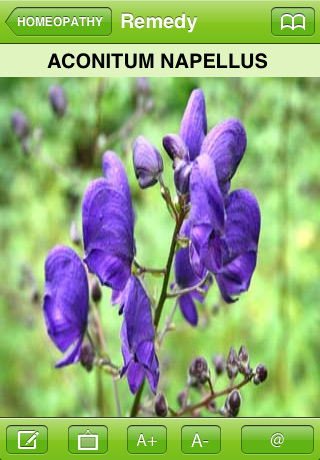 It contains more than 300 referenced homeopathic remedies related to more than 200 symptoms. – quick and complete search on Summary and Description fields. Search from words but also intuitive search from characters (intuitive search) plus case sensitive. – Connection with the E-Mail application, sending of the homeopathic’s file content by email. – more than 300 homeopathic remedies referenced (339). – more than 200 symptoms referenced (219). – The ability to create its own « Favorites » to instantly find a file remedy or symptom file. – You can watch list of records Remedies and Symptoms by index A, B, C. ….. if you modify your application preferences.